* Extensive filename schemes (see chapter filename schemes). If you rip an audio CD from the artist "Metallica" and the album name is "Metallica", the files will be stored in the folder <tt>/Metallica/Metallica</tt> within your base path you set in the general settings. If the folder does not exist, '''Audex''' will create it for you. | The artist of the CD. If your CD is a compilation, then this tag represents the title in most cases. | The title of the CD. If your CD is a compilation, then this tag represents the subtitle in most cases. | The release date of the CD. In almost all cases this is the year. | The genre of the CD. | The CD number of a multi-CD album. Often compilations consist of several CDs. Note: If the multi-CD flag is not set for the current CD, then this value will be just empty. | This is the artist of every individual track. It is especially useful on compilation CDs. | The track title. Normally each track on a CD has its own title, which is the name of the song. | The track number. First track is 1. Sometimes people don't like spaces in their filenames (mainly for historical reasons I think). If you set underscores as true within a variable parameter all spaces will be replaced by underscores "_". The parameter "fat32compatible" will remove all FAT32 incompatible characters (like "?"). Normally you won't use these two parameters, as there are options in the user interface for the complete filename. | The filename extension (e.g. 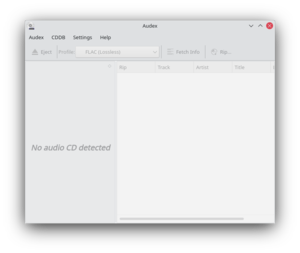 .ogg, .mp3), normally based on your encoder. This page was last modified on 13 March 2018, at 11:28. Content is available under Creative Commons License SA 4.0 unless otherwise noted.